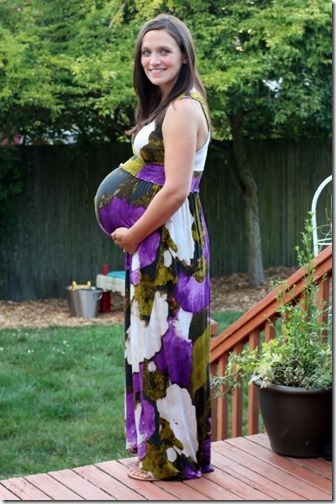 Another month has passed since I posted a pregnancy update, and somehow there is only one month left to go! I left off last at week 31 – feeling good and just starting to make some progress with nursery planning and prepping. And here I am now, two days shy of 36 weeks and exactly one month out from my due date. Hard to believe! 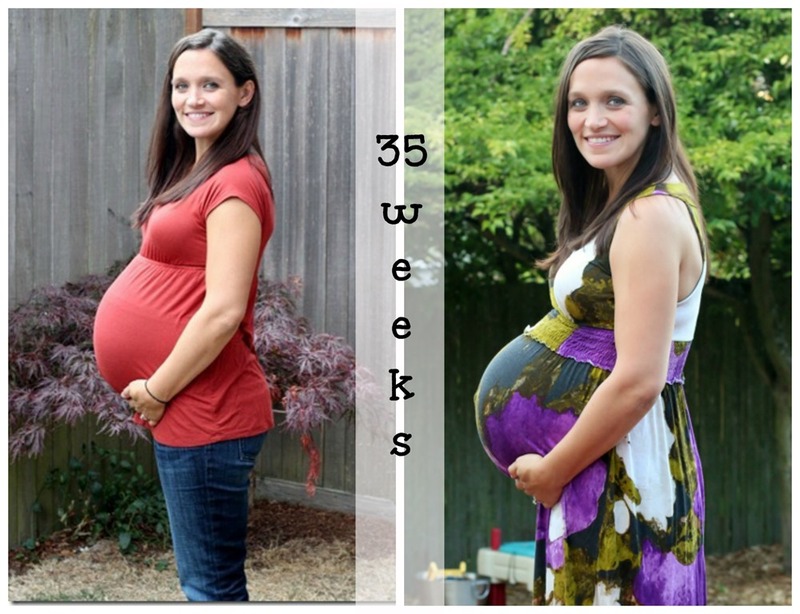 I actually had a really hard time physically during weeks 32 to 34, which might also explain the lack of photos. Everything ached, and by the end of the day I’d find myself almost in tears with leg cramps, back pain, and just overall discomfort. My energy plummeted and I found it hard to do much of anything beyond really basic tasks. Pregnancy insomnia has been in full swing, and there were a few weeks where I found myself just sitting up in bed at 2am every night, wishing for sleep but finding it impossible. Of course, I am more than ready to hit the pillow at 2pm every day, but that is usually not an option. Overall, I’m just…tired. With that said, a lot of the discomfort subsided in the past week or two, and I’ve felt a lot more like my old self recently. I think I might have been going through a big growth spurt that was causing a lot of my aches and troubles. But growth seems to have stalled or at least leveled out a bit, and I’m feeling much better as the end approaches. Other than serious fatigue and lack of energy, I feel pretty lucky to be doing as well as I am. I don’t have any swelling or other pain, and I’m still staying pretty active. At this point I’m down to one Barre3 class per week, as it’s all I can realistically manage. Cullen is going through a phase where he wants to be carried all the time, so I’m also hauling 30 pounds around in my arms more often than not. My arm muscles are dead tired by the end of each day! I had several people tell me they think I’ve dropped based on this photo – taken at 35 weeks – but I think it might just be the angle. Nothing really feels different as far as how I’m carrying goes, but who knows. Also, I am in love with my new tie-dye bamboo shirt (from a local market). I’m definitely carrying much differently this time, which I have known for a while. I have a massive torpedo belly, and absolutely none of my shirts can cover my stomach anymore. Even the tank tops I loved last time and considered to be so long are creeping up and up! It feels somewhat ridiculous. I have been really blessed with friends loaning maternity clothes this time around, and I’ve pretty much outgrown anything that actually belongs to me. 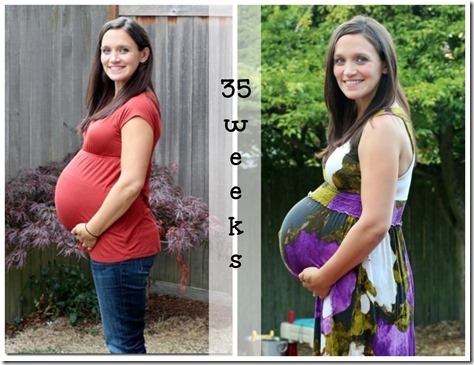 People continue to ask me if I am sure I’m not having twins or perhaps my due date is wrong. Believe it or not, I’m measuring right on track according to my midwives – I’m just one of those people that grows big babies and has a big belly! 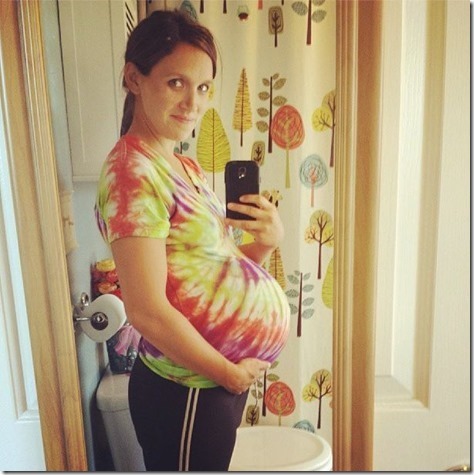 I had a prenatal appointment last week, which was short and sweet. Not much to really do or say at this point other than basic checks and vitals. There is no question as to whether or not baby boy’s heartbeat is beating away in there, since I can feeling him poking and kicking me all.day.long. He is such an active little guy, and I’m savoring each jab as I remember how much I missed them the last time. I’m also really feeling the pressure and nesting urges to get all of the bedrooms and things situated sooner than later. I’m not expecting a perfect nursery setup on the day of his arrival, but I’d definitely like to be farther along than we are now. I keep hesitating on deciding whether or not to move Cullen to his “big boy bed” – which will be a twin mattress on the floor for now – sooner or later. I’m starting to lean toward tackling this now, and made slight progress by actually ordering him some twin bedding. Baby steps. I also moved the changing table into the nursery, so Cullen can get used to being changed in there for the time being. I’m just trying to take it piece by piece and feel it out as we go. I’m considering trying to talk Casey into painting Cullen’s room this coming weekend. Nothing like the last minute, right? I’m also having major second thoughts on our name choice. I’ve never felt totally sure about it, and lately I’m just not sure it’s right. We have a few other contenders, but we are definitely still not set on any one name as of today. I can sense that the end is near because – as I’m sure you can tell – I’m hesitating and avoiding decisions left and right. This is totally in my nature, and drives everyone around me insane. I can’t help myself. Although the end is not allowed to be too near, because if baby brother arrives any time in the next three weeks, we’re going to be scrambling to figure out how to logistically manage the whole labor process. We have a plan in place with friends who Cullen absolutely adores, and they will be taking him while Casey and I are at the hospital. The only catch is that they leave for Europe today and are gone for the next 2.5 weeks. I fully expect to (and have been told by my midwives that I will likely) go to full-term if not longer, so I’m not overly concerned about this. But little man needs to stay put until at least the end of this month! Of course, if something does happen sooner we have backup plans, but it’s definitely best for many reasons if he can hold off until his due date. I can’t wait to see how the rest turned out, and I feel so grateful to have this special time in our lives captured so beautifully. One month to go! Baby clothes washed: Zero. Waiting until our new washer and dryer arrive next weekend! Baby items purchased: Zero clothes, one baby monitor! « Previous PostLabor Day Love. Next Post » To The Rescue. Oooh, very exciting, I bet you can’t wait :) You are looking stunning still, when I was pregnant I looked a mess lol. Oh, that first picture from the maternity shoot is PRICELESS! I can’t believe you only have a month left! It feels like you just announced it! I’m sorry you’re feeling so tired, that has to be rough, especially trying to juggle being pregnant and having an active toddler. I hope baby #2 stays in until his due date and that you get some rest! You look lovely! Hang in there!!! I know several others have posted about their experiences — and I’ll share mine from 9 days ago. I was induced with #2 at 5 days overdue. This guy was 8lb, 5oz… my first was alb, 15.8oz. After a grade 2 tear the first time, I had almost zero tearing this time around… just a few stitches. I can’t even begin to describe how different my recovery has been this time around except to say it’s been SO MUCH easier. I’m already chasing after my almost-2-year-old, doing laundry, making dinner and walking around the neighborhood. The afterbirth pains/cramping were whoa painful at first, but died down after a day or two. I recommend heat packs for when you nurse in that 12-36 hour period. But my first paved the way for my second, just like the nurses said usually happens. You’ll do great!! Oh and I stopped carrying my first a few weeks before my due date. It was more because my husband said I shouldn’t strain and risk hurting myself. But I felt great — I didn’t think I needed to. 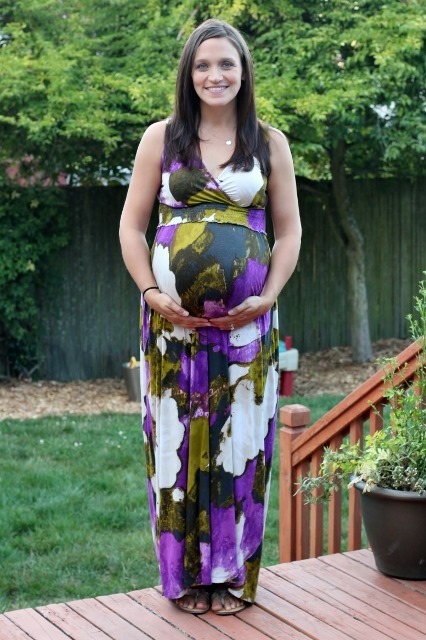 But I’ll say this — it helped with the transition right after my LO was born. I physically couldn’t pick up my bigger guy… my core was shot. He was used to giving his “up up up” to Daddy by then and I didn’t worry that he was getting the impression that it was only because baby brother was here that Mama couldn’t hold him. Now that I’m feeling better I can pick him up… and he feels REALLY heavy! :) Just my experience! I’m in the market for a new washer/dryer. It looks like you’ve used some pretty new ones. Do you have a favorite washer/dryer that you’ve ordered? Your belly is cute. And I like all the tie-dye. 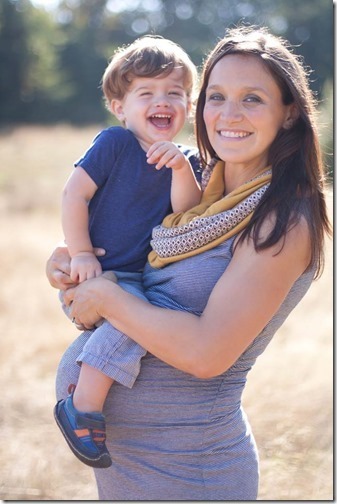 I recently started reading your blog – I think I found it from googling postpartum running, as I am 4 months postpartum with my second daughter. I was reading your most recent post and thinking about how you said you’re carrying more torpedo-like this time. When I noticed this in a friend with her third baby, my midwife said that can happen with 2nd, 3rd, and so on babies because the mom’s abdominal muscles aren’t as strong and the diastasis recti gap is wider, thus offering less abdominal support than in the first pregnancy. 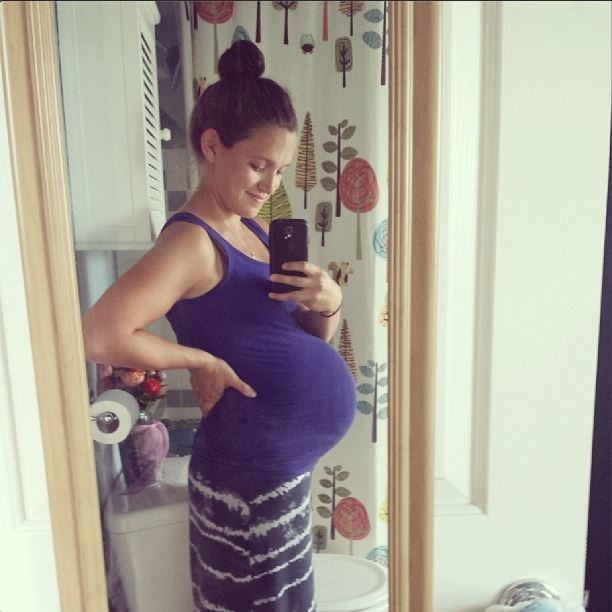 I think few women know about this, or about the ab exercises you can do while pregnant and postpartum to prevent the gap from widening too much and help it close quickly postpartum. 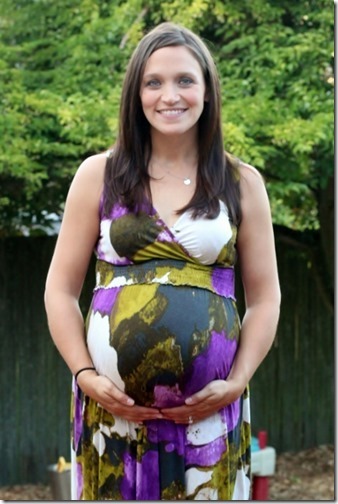 I am lucky to have a pregnancy pilates instructor in my town who teaches about this. 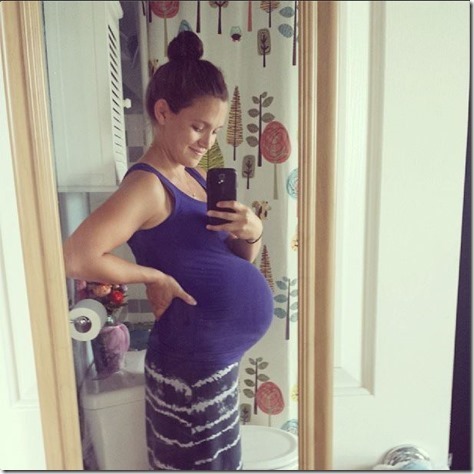 Anyway, be sure not to do any sit-ups or crunches until at least 6 months postpartum, and check out these resources if you want more info on how to strengthen your abs while pregnant and recently postpartum. ps – I am not affiliated with any of these people or products – I just wanted to share with you cause I have found this info so helpful. Strengthening my abs in this way has helped me have no back pain during pregnancy, push my babies out in just a few pushes, and close my diastasis quickly postpartum. Now I just need to remember to do the exercises daily! ps – you look beautiful, and I hope your last month of pregnancy goes well! Have you ever thought about writing a post about how to make friends when you move to a new town? You seem to do so easily and I’d love some tips. Making friends as an adult in a new city can be hard. Thanks! I LOVE those pictures you had taken. The one with Cullen’s little sandy feet is toooo cute! You look so cute! Pregnancy looks good on you. 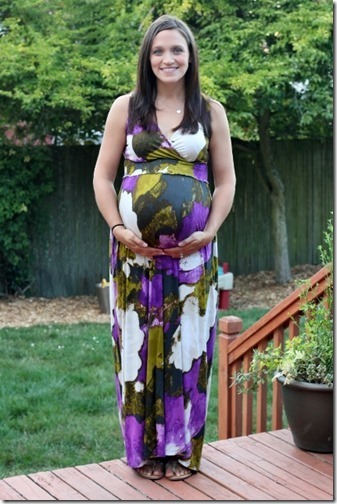 First Emily……..I LOVE the picture of just your belly and Cullen’s feet with both your hands. It is so original and cute! I have never thought about putting pumpkin into cornbread but I definitely will now! I have a great recipe for cornbread too but haven’t ever tried adding pumpkin and I love pumpkin EVERYTHING! Thanks for the tip! I hope you feel great these last few weeks/days. It’s such a wonderful time as you get excited about the arrival of the newest part of your family! I have a maternity shoot coming up, too! I love the dress you’re wearing in yours. Where is it from? I think it was Motherhood Maternity. I borrowed it from a friend!